Industrial settings in particular often require large, durable and reliable latches. 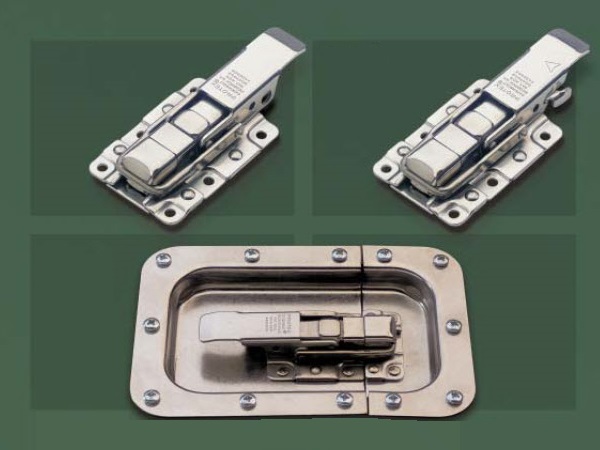 These latches are used for a variety of tasks such as industrial refrigeration, trucks, trailers, off-highway equipment, storage facilities, utility boxes and more. Industrial Latches – Hardware Mfg. Industrial latches are mechanical devices used in a wide range of contexts to provide a secure closure to two adjacent surfaces. Common latches include door latches, cabinet latches and gate latches. Latches are fabricated for a variety of functions and applications. The requirements for a latch vary in terms of applied force, exposure to the elements, intensity of use and function. These should all be taken into consideration when determining the best type and material for manufacturing an industrial latch. Stainless steel, steel, aluminum alloy, cast iron and brass are used to make durable and long lasting latches. Metal is typically a high strength material that can withstand repeated use and is fairly impact resistance. Stainless steel latches will not rust easily, however other metals are typically coated with chrome, or black powder coating in order to increase their strength and durability. Thermoplastics are also used in the construction of plastic latches which are used because of the added benefits of flexibility and increased impact and shock resistance. High strength plastics provide a functional latch for many applications and are commonly used in vibration isolation. The wide range of contexts in which latches are used necessitates a great variety of different industrial latch types and capabilities. Two different options of industrial latches include bolt latches and spring latches which are among the simplest closing devices. They consist of two adjacent plates or brackets which are joined by a pin. Slam latches offer the ability of allowing a drawer or door to be slammed closed without reopening; they are impact resistant and durable. Compression latches provide a tight seal to a frame, and can be constructed to be watertight if required. Draw latches are common in industrial enclosures, trailer panels and windows. This type of latch can be made of steel, but also sometimes has rubber components for added flexibility. The design of draw latches also allows them to be used in corners and on hinges, making them even more versatile. Bolt latches are found in industrial environments as well, though the use of a post in high stress situations necessitates a large girth to avoid breaking the latch. Paddle latches and slam latches are often employed in industrial settings as they are easy to operate and extremely durable. 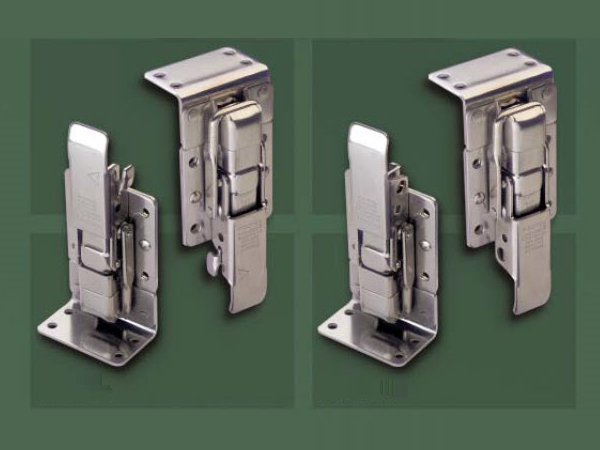 The majority of these latches are manufactured using die cast, stamped or forged metals with components being assembled and spot-welded as needed. Industrial Latches Industrial latches are a type of mechanical hardware that serve as a fastener for two ordinarily separated surfaces.